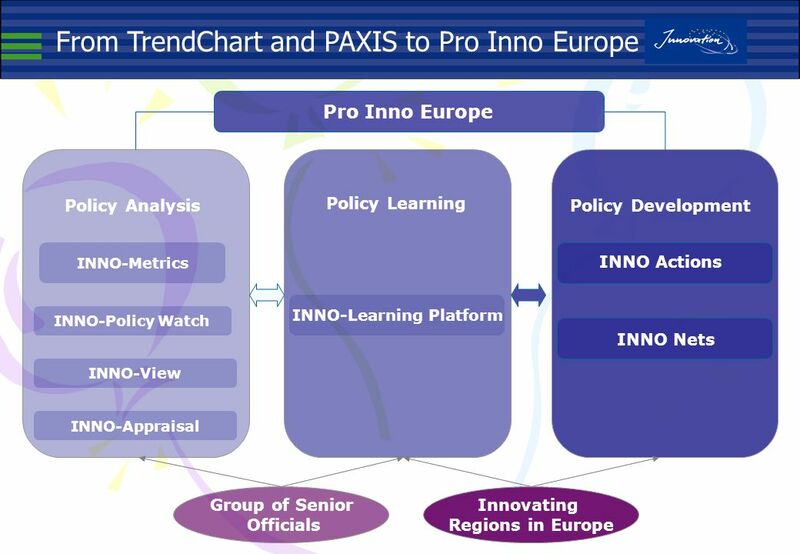 Innovation policy learning at the European level – from TrendChart to the PRO INNO Europe initiative European Commission Enterprise and Industry DG by. 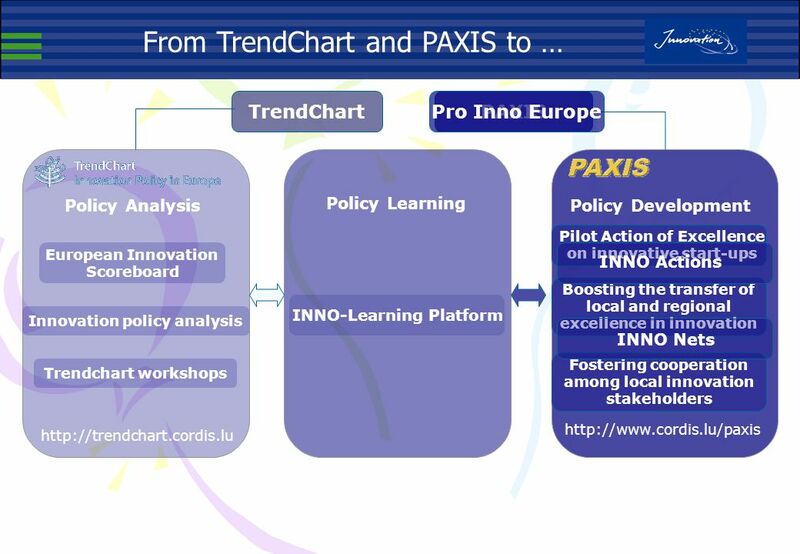 Download ppt "Innovation policy learning at the European level – from TrendChart to the PRO INNO Europe initiative European Commission Enterprise and Industry DG by." Mini Europe Briefing EUROPEAN CLUSTER DEVELOPMENT OPPORTUNITIES 8th December 2010 Bill Greenhalgh Cluster Strategy Manager. Innovation Policy Learning: Change in thinking – change in doing Six Countries programme workshop Stockholm, May, 2006 Hannes. 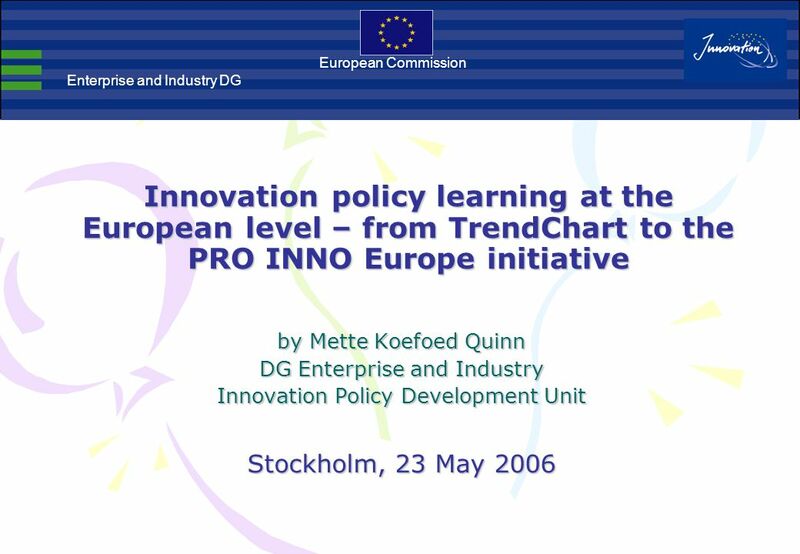 Enterprise and Industry Directorate-General Unit D1 Innovation Policy development European Commission Non-technological innovation and EU innovation policies. ERA-NET as a tool for facilitating Cooperation and Coordination between Ministries managing RTD Programmes , Brussels Petri. Athinai.4 Oct. 2010, Slide 1. Athinai.4 Oct. 2010, Slide 2. Georgia Tzenou, EKT/NHRF1. 1. Regions of Knowledge under FP7 (*Info provided by the European Commission) 2. TRANS REG NCP services 3. Research-driven. Smart Specialisation and Growth in the Baltic Sea Region Clusters and smart specialisation Kincsö Izsak, Technopolis Group, Brussels 5 April 2011. Launching OPEN DAYS December 2006 Scotland House. 1 Cohesion Policy support for Sustainable Energy Brussels, 11 October 2011 Maud SKÄRINGER European Commission Directorate-General for Regional Policy. Enterprise Europe Network and LMI: …..
Flagship Project: a channel for development work and to build partnership Baltic Sea Strategy: State of play before the European Comission Review. 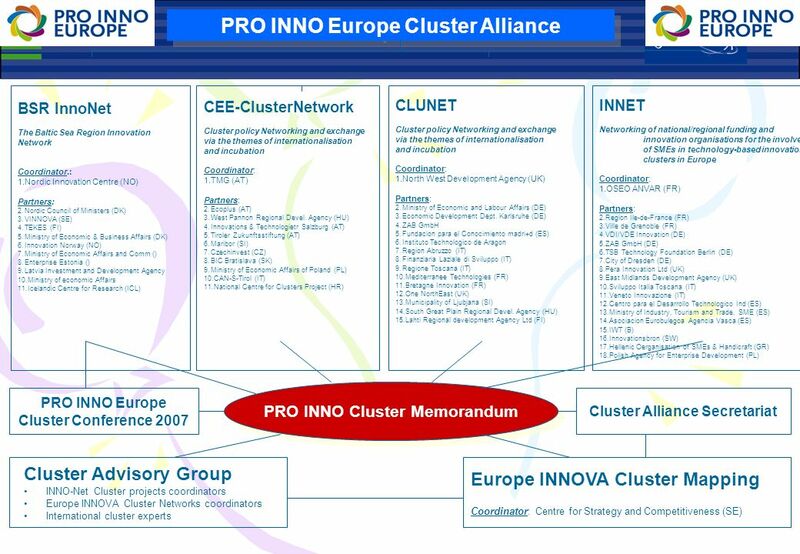 BaltMet Inno Project – Common Ground Created for Transnational Cluster Co- operation in the Baltic Metropolises Helge Neumann, Executive Manager International. Agencies and sectors for technology and innovation Innovation Pole: Services and Networking for Competitiveness and Innovation in the Lombardy Region Attilio. Research and Innovation Research and Innovation Results of the 2012 Survey on R&D investment and policy measures Pierre Vigier DG Research and Innovation.